Flashbacks have been a part of Arrow’s DNA from the very beginning. At times they’ve been vital, at others, entertaining. They’ve been sometimes surprising and even occasionally moving. But they’ve also been filler, and they’ve been filler with some frequency over the last several seasons. When the bombs on Lian Yu went off, it was easy to hope that the whooshing flashback sound might blow up, too. It appears that a reduction in whooshing is the best we can hope for—and to be fair, the flashbacks in “Deathstroke Returns” are far from the worst that Arrow has to offer. Still, they’re not great. It’s not that Slade’s backstory is inessential. Far from it. It’s that the end result could have been achieved in half the time, if not less. Please, by all means, show us things that happened months or years ago. Give us insight into character and lean into theme. Just please, no more filler. “Deathstroke Returns” does a fine job of several things. It marks the return of Manu Bennett’s Slade Wilson, and that’s pretty much always good. It ties Oliver’s big arc — leaving the hood behind so he can be a father to a son who just lost the mother who raised him — to Slade’s current story. 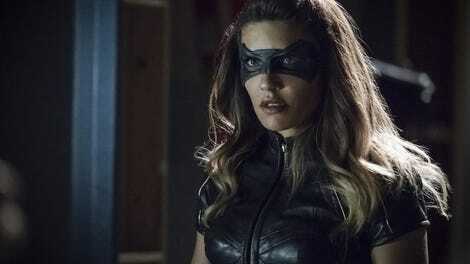 It give Juliana Harkavy’s Dinah something to do besides glower at Dig. There are a few good fight scenes, and William gets something that’s almost a punchline. That’s all welcome. Still, overall, there’s something about this episode that feels thin. It’s as though this was always intended to be the first part of a two-parter, only somewhere along the road the Arrow writing team realized they just didn’t have enough stuff to fill part one. The result: some time spent watching Slade Wilson load his camping equipment into a trunk. When Arrow’s flashback stories work, it’s because the events of the past are directly tied to the present — not because of events of the plot, but because of the inner lives of the characters. The best manage to do both, making a story about Oliver’s relentless guilt also a chance to set up some big reveal. That’s not the case here. There’s nothing we learn from Slade’s father-son-target camping trip that can’t be intuited through the choices Slade makes and the performance Bennett gives. It’s all there: the distance, the regret, the self-disgust, the desperation. The most important aspect of the flashback story, the revelation that Slade’s tense reconnection trip with his son is actually in service of a mission that results in a man’s death, could be conveyed in conversation, recollection, or even one single flashback. Slade banters with his son about fish, slightly thawing a frosty atmosphere, denies that he’s anything but a pilot, then sends a message that a target has been sighted. Mission accomplished. As stated above, they’re not bad, just a little bit thin, particularly compared to the rest of Slade’s storyline. The actual “twists” might be predictable (at least, they were for me — kid ‘dies’ in prison, friend is involved in the Jackals, kid is actually leader of the Jackals) but the heft of the story works, thanks largely to the consistently appealing chemistry between Bennett and Stephen Amell. Theirs is a strange, uneasy truce, but one rooted in genuine affection but weighed down with a metric ton of baggage. 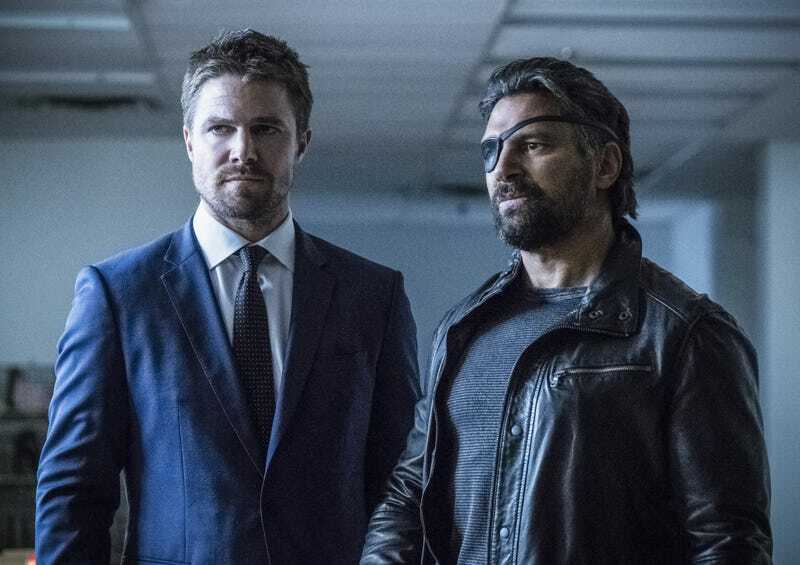 As a reminder for those who have an understandably hard time keeping track of the many reversals and resurrections on this show, Slade Wilson kept Oliver alive on the island and trained him to fight. When he nearly dies in an explosion, Oliver injects him with Mirakuru, giving him a serious case of bloodlust and a fiery desire to murder the person who he believes is responsible for the death of Shado, a woman he and Oliver both cared for. Fast forward five years and Deathstroke’s murdering Moira Queen and destroying countless lives. Post-Mirakuru, things remain complicated. The length and complexity of that relationship gives Oliver and Slade’s field trip much of its heft. The audience has years to call on, and Amell and Bennett to terrific work in letting the color of those years infuse their scenes together. Every time Slade calls Oliver kid, it’s just a little bit loaded and sad; when Wilson talks about Oliver standing with his feet in one world, it’s with an appreciation for what that means that goes beyond simply understanding the concept. Is it a great story, overall? Nah, but it’s not bad. Much more importantly, it’s faithful to what we know of these people, and Amell and Bennett make the most of the opportunity. The Black Canary story for the week is also steeped in history, but because it’s one we know little about, it’s difficult to feel as invested. None of that’s the fault of Juliana Harkavy, who really goes for it throughout “Deathstroke Returns.” Despite the underwhelming revelation of Vigilante’s identity, this B story is mostly successful. That’s largely due to Harkavy’s commitment — we don’t know her long-lost partner, but we know how it affects her, because she allows us in. It’s a welcome change after five episodes worth of glaring at Dig. It may be Harkavy’s best work on the series to date. For all this talk of long history, however, the series seems to have a short memory. Outside of the opening credits speech and a few quick hood appearances here and there, Arrow seems to have completely forgotten that John Diggle is the Green Arrow. I know it’s likely not permanent, and that the clock is ticking. But while Dig is the Arrow, why not let him be the Stephen Amekll for awhile? I’m gonna need Samanda Watson to hurry up and get worthy of Sydelle Noel’s talents. Fun performances from most of the cast.